A big push on Friday looks to have given bulls an edge. How did the Stockcharter's see it? Dr. Joe kept an eye on Oil as it continued its march ever higher. What do stochastics say here for the Dow? Will the next backtest reset support/resistance for this indicator? The daily DJIA got a break above its double bottom confirmation line of 12,767 on Friday. The pattern measures 1133 points having a target of 13,900. I expect the other daily index charts such as the S&P 500, the Nasdaq, and Russell 2K to follow the Dow's lead, and eventually move above their confirmation lines. Once the double bottom patterns breakout, prices will challenge the intermediate downtrends. However, the Russell 2K must break above its intermediate downtrend before it can break above the double bottom pattern. The S&P 500 rose 4.31 %, the DJIA increased 4.25 %, and the Nasdaq climbed 4.92 % for the week. 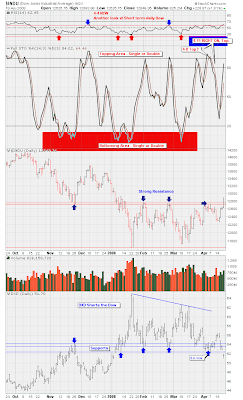 The market conditions continue to be favorable, as the market continues to rally on bad news. Two weeks ago the market held on to gains after the worst jobs report since 2003. 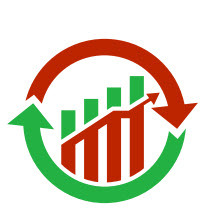 This past week more bad news occurred as housing starts hit a 17-year low, the consumer price index rose by 0.3 %, taking headline inflation to 4.0 %, and Citibank reported a 5.1 billion dollar loss for the first quarter and a 12 billion dollar write down. Meanwhile, earnings continue to flourish as intel, J.P. Morgan, Coca-Cola and Google reported better than expected earnings. The Volatility index (VIX), which is a gage of fear, decisively broke down this week below the 2007 rising trendline, which signals less volatility going forward. Market breadth significantly improved as measured by the Advance-Decline line. Last Tuesday, the S&P 500 daily chart got a backtest to its trendline that developed off the December highs. The backtest was contained at 1324, just one point above our target of 1323. From there, prices surged above two resistance levels at1367 and 1386, continuing to make higher highs and higher lows on the 60 minute chart. 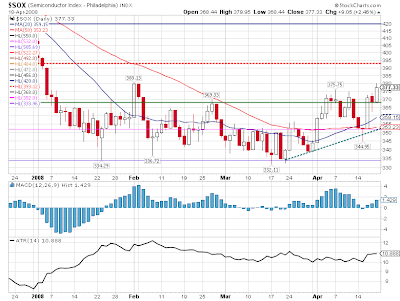 Prices rose right up to key resistance at 1396 and stalled there. This is the confirmation line of the S&P's double bottom. Once the pattern breaks out it measures 140 points with an objective target of 1536. Just above the DB confirmation line is the intermediate downward trendline, once prices exceed that level it will mark the breaking of the third fan line (1st chart down). This will signify two things, first that the intermediate bottom of the correction has been seen, and that the correction is over. 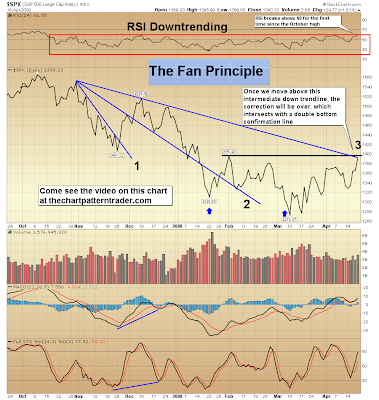 Parenthetically, come see the video on the fan principle at thechartpatterntrader.com. Moreover, the RSI now has multiple points of long term positive divergence on the daily chart of the S&P 500. And subsequently, the RSI moved above 60 for the first time since the October high, suggesting that a change in trend is about to take place. The RSI has had a difficult time, in each attempt it has made to rise above the value of 60. If it manages to rise above 66.67, the RSI mathematical ratio will shift the odds in favor of the bulls. Changing the RSI ratio from 1:1 to 2:1, meaning that there are twice as many up days as down days. The trend-based indicators on the index daily charts remain positive. The ADX, Aroon and the MACD each have produced positive signals that a trend is developing, as this weeks low produced a minor trend channel. 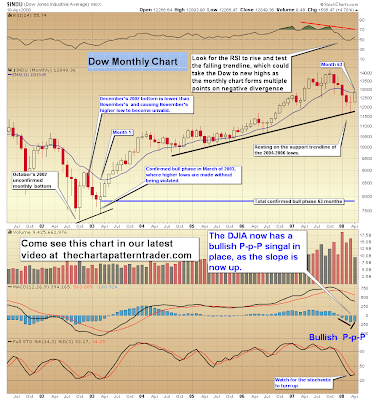 The DJIA monthly chart (2nd chart down) is starting to turn positive once again, as the MACD histogram got a bullish P-p-P signal, in addition to positive divergence. The full stochastic (14, 3, 3) is just two-points away from getting a bullish touch. Its RSI is in the process of rising to test its previous peaks. If that occurs the DJIA stands a good chance of testing the October highs. 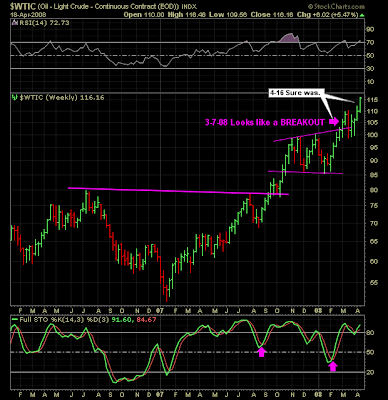 The index weekly charts continue to be favorable as the MACD histogram got a higher bar for the second week in a row. The force index moved back into positive territory shifting the balance of power to the bulls. The S&P 500 has currently stayed above the previous descending triangle pattern on the weekly chart, for five-weeks in a row. 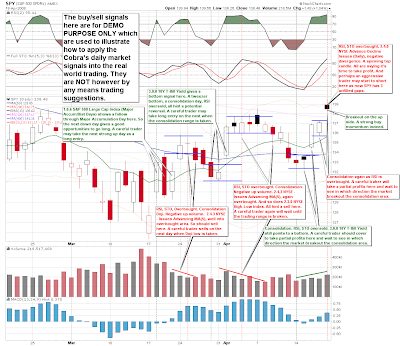 Incidently, last weeks candlestick was a bullish engulfing bar. On the Index charts, the double crossover method of the 10- and 20-day EMA continues to empower the bulls. Watch for both of those EMAs to cross above the 50-day EMA. This hasn't occurred since the triple bearish cross occurred in early-November. The 60-minute charts are now overbought, but still could go higher, and the 10-minute charts have not flashed a sell signal. I continue to believe that the market will do well until April 30, when the figures of 1st quarter real GDP are be released. 4/17 -- Here's my view of what's happening. The market is extending its rally off the bottom, fueled I suspect by gobs of money on the sidelines (cash held back + cash frustrated with low rates + pension money that comes in at this time of year) and by the view by some that the worst is over for the economy. (Even the Economists seem very divided on that issue.) Chartwise, the short term uptrends are still fairly steep but are more well defined in both 5-min and hourly charts. There are a number of charts crawling up along the lower lines of steep uptrends. They could bounce upward off those lines for another good rally or they could potentially break. We should know pretty soon (like Friday), despite the expiration day games. Even another spike upward, however, will soon meet major resistance from declining long term lines on one and three year charts. So...we're heading higher until we break short term charts and the small caps look even more bullish than the large right now. But then watch out when reality hits that we've got a ways to go on the recession. 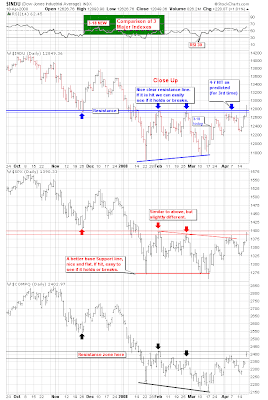 4/16 -- Seems to me the market is unrealistically bullish here, but the market is always right -- right? Probably just too much money on the sidelines that is scared to miss the recovery. Anyway, new ST uptrends are now in place, though the current legs are too steep to sustain, so things should flatten somewhat tomorrow. It now looks like the market wants to head back up to the long term downtrend lines on the one-year and three-year charts. For the short term, we will need more data for more realistic upchannels.